Sidharth Bhatia’s book on movie production house Navketan Films begins with a short passage on the writer accompanying his subject, actor Dev Anand, to a screening of Hum Dono at Delhi’s Siri Fort Auditorium. It is 2009, Bhatia expresses his initial scepticism about new India’s interest in this film from 1961 about mistaken identity, where Anand plays a “haw-hawing" English sahib for one of the double roles he essayed in it. Bhatia then goes on to describe how young and old people mobbed the ageing star after the screening. Anand is not known to be the easiest interviewee—like many, but not all, stars his narcissism often colours his stories about himself and even others he worked with. His autobiography, Romancing with Life, is a glowing testament to that. Bhatia chooses not to break through this barrier, and that is his book’s weakness. Anand’s voice is almost absent (in his own words are observations on close friend Guru Dutt, who, he said, would “shoot and shoot and shoot", who was “indecisive and unsure"), which is good, and can be a conscious choice for authors who chronicle a life or an era, and in this case, an institution. But there are no insights through narration and interpretation, mostly a linear retelling of history. 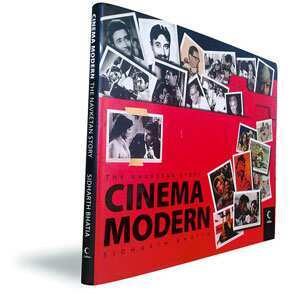 Although largely absent in his own voice, Dev Anand understandably is the real subject of the book. After all, he was its creative force, and it was he who took all the decisions to set its agenda. At the cost of telling his story through Navketan’s flamboyant face, Bhatia does not explore the other two Anands. He writes that Vijay, or Goldie, was a prize-winning theatre director in college who wrote dialogues for Taxi Driver when he was just 19 and wrote and directed Guide when he was 30. Under Navketan, and the genius of Vijay Anand, was the birth of the Hindi crime caper—his racy, song-and-dance thrillers that set new precedents. Chetan Anand’s sombre idiom inspired by European masters gets a brief mention. Now that book would be the perfect sequel.